This is quite the odd little piece. 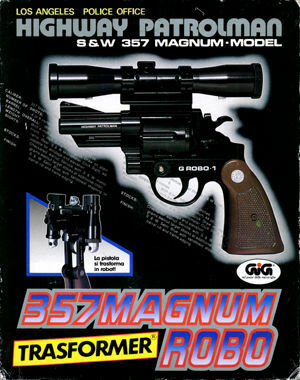 This 357 Magnum Robo isn't a Transformer or a Microman Gun Robo. He is a Trasformer! The .357, which is really a .38 police special, is very similar to the series of Gun Robos in the Microman line, but does not replicate any one Microman piece. Despite this, he is an obvious Microman descendent, as one look at his head would attest. He transforms from a very realistic looking gun and scope to a tall, lanky robot with a large, protruding barrel for a chest! He comes with a box of plastic bullets that can be loaded into the chamber and fired by the normal means. The cylinder chamber, trigger and thumbcock are all made of metal while the rest is entirely plastic. He is billed as a Trasformer and seems to have been released after 1983, which means he probably has closer ties to Takara's Transformers line than to the Microman line. This particular Gun Robo was released by Gig, licensed from Takara. It is not known whether there are other Trasformers or not, but it is suspected that there are.